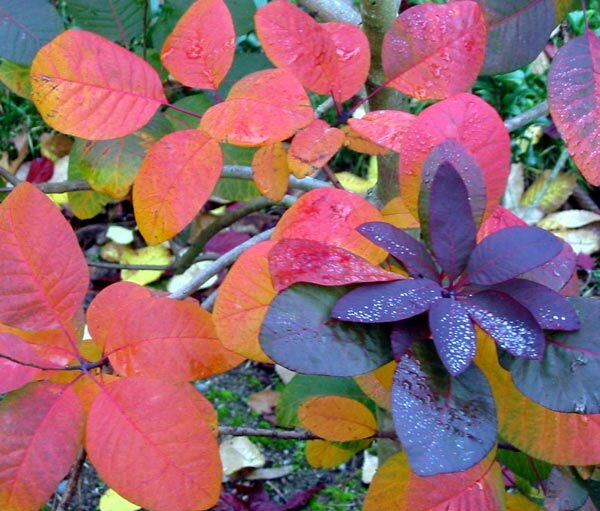 There are two main types of Smoke Bush, or Cotinus, and I only grow the purple-red leaved variety. Their small flowers look like puffs of smoke over the purple leaves, and the autumn colour changes are quite stunning. All my smoke bushes insist on some quite bright orange tones before leaf fall - these are colours hard to ignore. And in mid-summer their puffy fluffy flowerheads look quite ethereal. The dusky purple foliage is valuable in a mixed border like the Dog-Path Garden, as I grow a number of small flaxes in red and pink tones. I like this repetition of colour very much. I often cut some small branches to complement floral displays in the house. And in Autumn I am kept really busy taking photographs of the changing leaf colour! 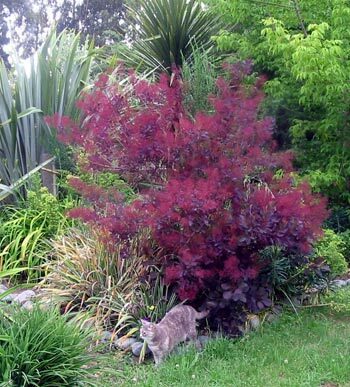 Cotinus will eventually turn into a small tree - I haven't had any of mine in the garden for long enough to worry about this! I do know that some gardeners hard prune their Smoke Bushes in winter.